Last night, the police came by to tell us that at least 4 other houses had their cars broken into (as well as ours). A few weeks ago, they hit a few streets over. I know FPD got one of the guys from a few weeks ago as my son's girlfriend got her laptop back today. Keep vigilant and make sure to take valuables out of your vehicles. I don't care where you live, if your car is not garaged and it gets broken into and you lose some valuables, I don't know what to tell ya. Oh, wait.. "stupid should hurt" comes to mind. Don't enable the animals and the druggies. Ain't open borders, soft on crime, and *tolerance* great !! American River Canyon, South. Not sure exactly what it's boundaries are. should be ARC south of the waterfall. 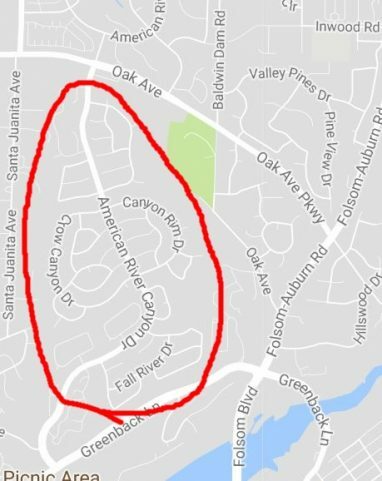 so basically, from Greenback up to the waterfall that's on Oak Ave.
ARC south is filled with older homes before the big custom homes were built in ARC north of the waterfall. There are some nice homes in there, both big and normal size. Also known as the "slums of ARC". Lol. That still tickles me (heard on soccer field).